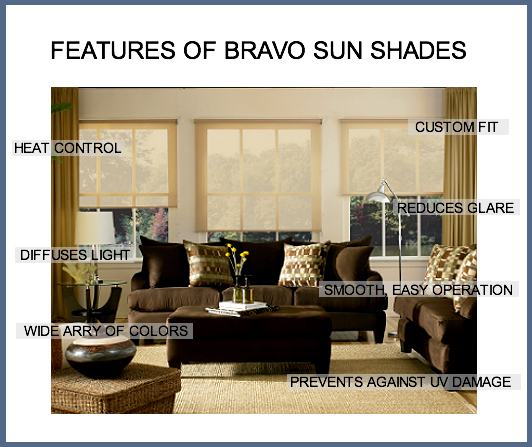 Bravo sun shades or solar shades provide excellent protection from the sun, all the while preserving your views. Our solar sun shades are know for their ability to reduce glare thus, making them well suited for any room. Bravo solar shades have a basketweave design made expressly for those insulating and glare-blocking applications which require a more private and non-directional fabric. The material is a PVC-coated fiberglass yarn. All Bravo solar sun shades come with standard clutch mechanism for easy release and control. Available in a variety of colours to accent any decor. Bravo solar shade screens rated number one by our customers!